"Over the past few years, String Studio VS-3 has become a true go-to synth for all manner of unheard-of, yet seemingly organic sounds. From film scores to game sound design, String Studio VS-3 is one of the few software instruments that tests the limits of what can actually be achieved with physical modeling." "This set of 128 patches I have created and used in various projects is an experimentalist's labor of love, a homage to the great composers and sound designers who have inspired me, but most importantly, it is a collection of living sounds meant to augment, and in some cases replace traditional acoustic instrument in Electro-Acoustic, Ambient, and Film music arrangements." "I encourage you to take the time to explore each sound's range, tuning, and response. It would also be a good idea to look at the preset notes I have included with most of these patches in order to get a feel for their origins and intended use, but don't hesitate to make them yours and tweak their DNA." David Kristian accumulated an impressive amount of releases in feature films, shorts, videos, and CDs. Since his last 2005 CD release, Rhythms for a Rainy Season, David has focused more on music for films. David's latest work is a collaboration with Emmy Award-winning composer Ed Dzubak the Douglas Buck's Sisters score. He also created music and soundscape for filmmaker Francois Miron's The 4th Life. Over 70 minutes of David's unsettling music and soundscapes are featured along with the work of legendary sound designers Glenn Freemantle and Andy Wilkinson (28 Days Later, V for Vendetta), and composer Alfons Conde (who wrote the opening titles music) in Nacho Cerdà's long-awaited The Abandoned. Since 2012, David worked as an audio artist and co-composer on Ubisoft’s much anticipated Watch Dogs game which features next-gen graphics and sound design. Read our interview with David Kristian. 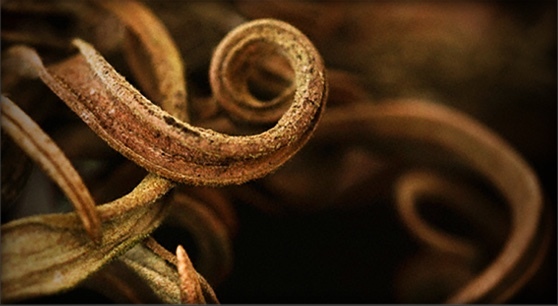 I think Entangled Species is stunning. David Kristian has managed to push the String Studio engine (and particularly the Bow excitator) in ways that I hadn't thought possible. There are some sounds in that bank that could have come straight from an Alfred Hitchcock film! Truly excellent work! Entangled Species was created with the String Studio VS-3 string oscillator synthesizer. 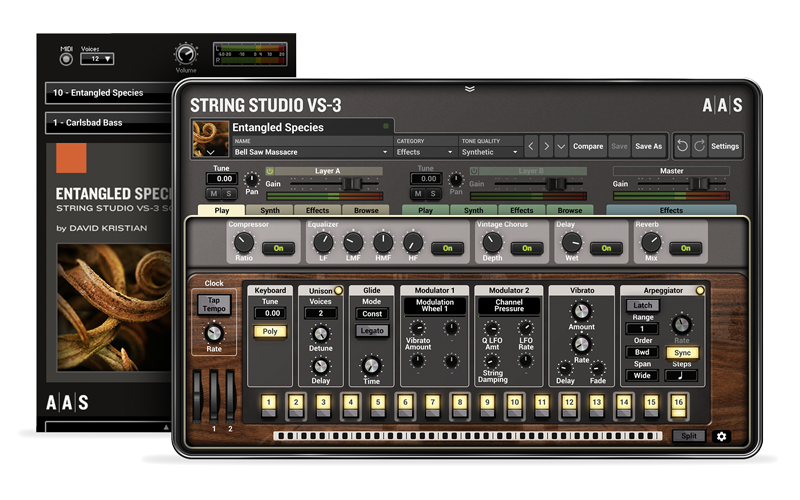 You can obviously play and edit the sounds in String Studio VS-3, but you can also access and play them via the free AAS Player included with your Entangled Species purchase.